I agree. Bears are adorable. Most of the time. 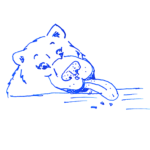 Ursus Arctos Horribilis…in other words: grizzly bear. Even it’s latin name recognizes all that we fear in that animal. It’s “cousin,” Ursus Americanus- the black bear – isn’t something to be reckoned with either. While it doesn’t pay off to be terrified by either of these enormous mammals, you won’t regret paying attention to some bear safety tips. First off, know that bears hardly ever become aggressive without provocation. Classic examples are walking between a mother and cubs, in some way threatening the bear, or by startling it. These creatures are not socialized to humans. They may ignore you, or approach passively. They are always dangerous. Never lure or approach a bear. Ever. You’d want the same of them. They are active from spring to fall, and occasionally in the winter. Be especially cautious during berry season (they may be full but they’re not sharing! ), and when cubs still travel with their mother. So basically always. Bear country is everywhere. Almost. It’s wise to practice the following tips anywhere you travel. They apply to most predators found in the US. 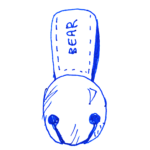 In the case of bears, be especially careful in mountainous and wooded areas. How do I stay bear safe? Trash, food bits, and anything that smells good will attract wildlife. Wipe crumbs off of picnic tables, wash all your dishes away from camp, and don’t leave out anything aromatic (nope, not even stinky clothes if we’re being serious). Everything goes in a secure storage space when you’re done. And we mean everything! Coolers, water bottles, gum, sunscreen, chapstick, dog food, trash, etc. 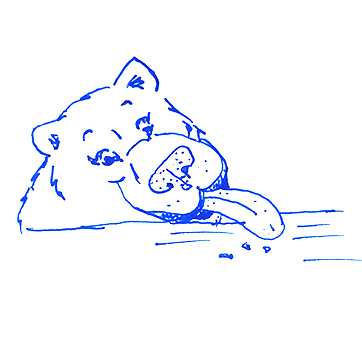 Bear-proof boxes provided at campgrounds and hard-sided and entirely enclosed vehicles count. No tents, soft-sided campers, open-bed trucks, or vehicles with windows down/doors unlocked. Safety in numbers stands. Bring your dog, a friend, or even better: a whole group. You’re trying to alert wildlife to your presence. In order to be effective you must make noise continually – otherwise you might startle that bear you’re avoiding. 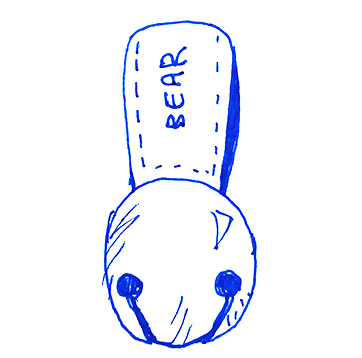 Bear bells are a good investment. Trail songs and conversation works well too. Make more noise the less your surroundings are visible. I.e. traveling through heavily wooded areas, coming around bends, cresting hills. This is vital. We recommend bear spray (not pepper spray!). This works better than a knife, for example, because you don’t have to get into close range to defend yourself. 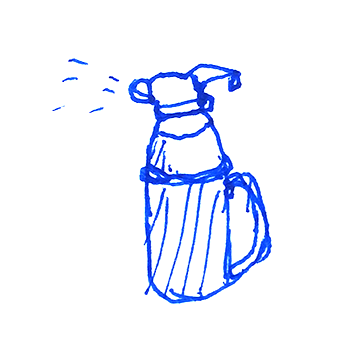 Note: pack bear spray properly. Buy a case to store it in you vehicle (they explode on occasion – not a good mix while driving). Leave it be. Get away if you can do so without drawing its attention. Take photos once you’re a good quarter mile away. I’m inside, but there’s a bear outside? Make sure it stays that way. Keep the doors locked and windows closed. You should be fine. If the bear becomes aggressive it’s time to call for help. Consider arming yourself. Try not to provoke the bear. Don’t try to bait it elsewhere. Is it a grizzly? 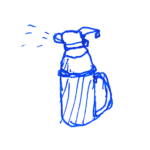 (Enormous, brown, with a big shoulder hump) Back away slowly and avoid eye contact. Try to spot a tree to scramble up and pull out the bear spray. Is it a black bear? (Dark or light and large, no hump) Puff up and try to scare it. Shout and make noise. Have your bear spray ready. Do not run or climb trees. You’re very unlikely to have a negative encounter with a bear. Even less likely if you follow these rules. Eventually, it usually boils down to luck. But it’s no reason not to enjoy natural places. You’re also at risk of falling trees, freakish weather, and getting lost. The itty-bitty risk is worth the reward. 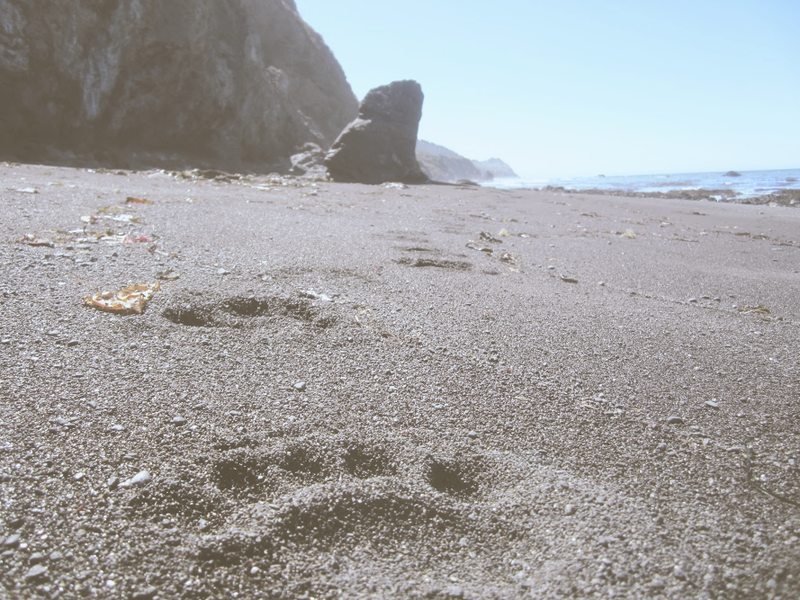 Black bear tracks on a northern California beach. One summer I was on a hike in Glacier National Park – AKA grizzly bear capitol. My group and I harmlessly wandered up, and then down the trail. We were nearing the last mile when another group stopped us and asked if we had seen the bear. What bear? The grizzly we had just passed. She was lounging in the field enjoying berries. Not a care at all for the hundreds of hikers she’d seen that day. Don’t be scared. Be cautious and aware. Most of all, enjoy your time in the wilderness!